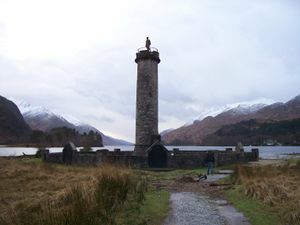 Highland is a region in Scotland. Kinlochbervie - still fairly important as a fishing port. 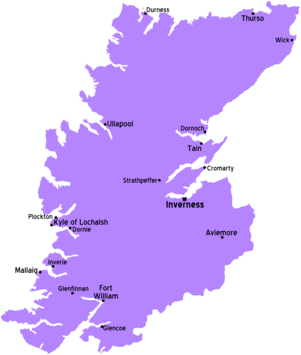 Cape Wrath - the extreme north-west point of Scotland. 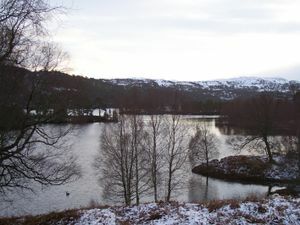 It can be reached either by a long walk or by a ferry followed by a minibus along a road unconnected with any other. Loch Maree - (correct spelling) - possibly the finest inland loch in the Scottish mainland, surrounded by peaks of Torridonian Sandstone. Inverewe Gardens  - wonderful NTS Gardens that take full advantage of the Gulf Stream to grow tropical plants at this very un-tropical latitude. Sandwood Bay reckoned by Undiscovered Scotland to be the best beach in Great Britain. Handa Island - wonderful bird reserve north of Kylestrome. Headware is advised in the breeding season as skuas are quite aggressive. There are far too many mountains in Scotland to cover them all here. Munro - mountain above 3000 feet. Corbett - mountains between 2500 and 3000 feet. Some popular mountains by group (pronunciations of difficult names in italics). Ben Stack - neither particularly high nor well known but a little gem. Mountains of Torridonian sandstone north of Ullapool. Quinag - An easy Corbett for beginners as it's possible to start well up from the main road south from Kylescu. Suilven - easier than it looks but its distance from roads makes it a challenge. Stac Pollaidh (pron. "Stack Polly") - Less than a Corbett but with an outstanding shape and rock ridge -unfortunately much eroded because of its proximity to the road. An Teallach (pron. "An Tyallach") - a fairly hard ridge walk above Little Loch Broom. Slioch - on the 'non-road' side of Loch Maree. Bein Eigh - above the Loch Maree road and much of the road from Kinlochewe to Torridon. 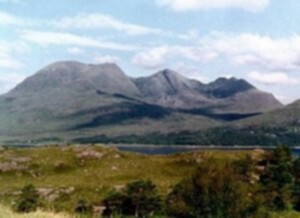 Liathach (pron. "Lee-a-hach") - above the village of Torridon. 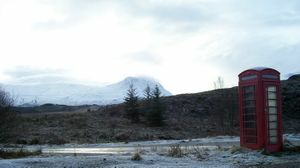 Beinn Aligin - above the minor road from Torridon to the Aligins and Lower Diabaig. Bein Bhann - otherwise known as the Applecross mountains. Ben Nevis - the highest start from the distillery on the road north. The Mamores - a picturesque group of numerous Munroes between Glen Nevis and Kinlochleven. Aonach Eagach (pron. "Annach Eegach") - a superb ridge above Glencoe. The three sisters of Glencoe - shapely peaks on the other side of the glen. A range second only in height to the Nevis range, located east of the A9. There is a railway up Cairn Gorm (which is not the highest). However you make the height, it's relatively easy to walk more peaks, with excellent views. It is the only area in the UK where wild reindeer can be seen - re-introduced from Scandinavia after becoming extinct in Scotland. Red squirrels are also to be seen in the remains of the old Caledonian Pine Forests. Lairig Ghru - not a mountain but probably the most spectacular mountain pass in the UK - making a fine and well known walk. This page was last edited on 21 April 2018, at 16:56.